We're not sure, but perhaps Buffone holds the record for playing for more different Head Coaches with the Bears than any other player in their 90-year history. In his 14-year career (a Bears record for seasons of service he holds along with Bill George), Buffone played for George Halas, Jim Dooley, Abe Gibron, Jack Pardee and Neill Armstrong. Buffone arrived in 1966 and before long had replaced Joe Fortunato, the longtime legend that preceeded him. 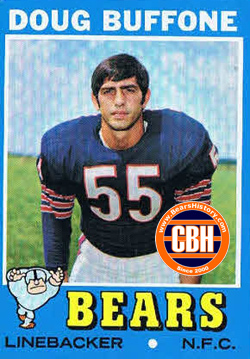 Buffone would provide determined and reliable service for the Bears, but was not rewarded as he played on only two playoff teams in that long career. The humble Buffone told me as I interviewed him for Chicago Bears History "the hell with me, I feel bad for Sayers and Butkus, legends that never made the playoffs." A suitable end to Buffone's career came in the last game he played at Soldier Field in 1979. The Bears needed to demolish the St. Louis Cardinals and have help to make the playoffs, and Buffone contributed by taking a fake punt for a first down. Buffone retired and launched a series of successful business ventures in the Chicago area, and still covers the Bears on the radio.